There’s a little-known occasion coming up at the start of next month that the GAA are rightly trying to push. On August 5, the centenary anniversary of Gaelic Sunday takes place to mark an important day of disobedience where close to 100,000 people turned out. What started a movement around the playing of our games, as is so often the case in such situations, was trying to stop people playing those games. That’s because back in the middle of 1918, the British government made the misjudged and stupid mistake of suggesting the GAA needed to apply for a permit to play a match. 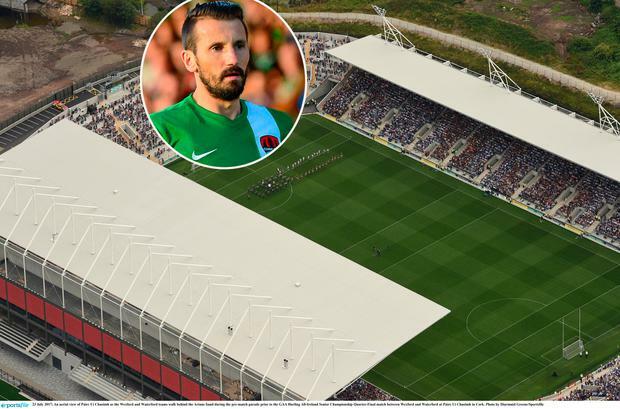 By now you know the story of Liam Miller and his testimonial. With the former Ireland international laid in the ground earlier this year, still four days short of his 37th birthday due to pancreatic cancer, it was decided to hold a game with the proceeds going to his wife and kids. His native Cork was the obvious place to host it but, with Turner’s Cross where he played for City for a couple of years only taking 7,000, an approach was made to Cork GAA about the use of Páirc Uí Chaoimh in order to maximise money but also provide a fitting occasion. However the association said no, citing their rule-book, while suggesting the use of their conference facilities to organise it. Fair or not, what was crucial were optics as it seemed like they were looking down their noses and offering condolences to the bereaved, while asking politely if they wouldn’t mind using the servant’s door on their way in as there are perceptions to maintain. This isn’t a cheap crusade or some easy outrage against the GAA, who often seem to spread themselves as big as possible to make themselves the most obvious target. Nor is this complex and it certainly shouldn’t be emotive despite the sad subject matter. Instead this comes back to the cold, sterile and obvious ideal of basic decency an doing right. No more. No less. But in refusing, it begs the question as to when doing that became so hard? The saying goes pick your battles as you don’t have to show at every argument you’re invited to, and this proves it wise. The Cork County Board and the GAA for some baffling reason decided that rather than shut up and nod, they’d go down the regulation route, hoping to cloud an issue to the point it went away. Their take was you can only change their laws come Congress and, while that was a bad enough attitude via such a simple matter, worse was the double-speak and hypocrisy. This after all is an organisation that just this month were willing to go against their own rulebook in relation to their venues. It goes on. As professor of sports law and former member of the association’s own DRA Jack Anderson believes, there are counter rules to get past this. “I would argue that Central Council has a discretion in rule 5.1(a) to sanction the event and that Central Council has used it before for various events,” he noted. His reasoning alone created enough ambiguity to just give the go-ahead. And while it’s a point that could be argued against, not even the association would find someone to put their head above the parapet and shout this down. Ultimately there were ways. What was desperately lacking was the will. And it reminded that in a battle for hearts and minds, it helps greatly if you display some semblance of those two. We’ve been here with the GAA before, in fact 20 years ago in the aftermath of the Omagh bombings, soccer was turned away from Healy Park to raise money for victims. It’s also true the GAA did gather and donate around €1m from a national collection and gate receipts, but could again have made it all so much easier on themselves by not quoting certain bylaws at certain times. While you cannot change the past, you can show you have changed with your decisions and attitudes placed against that past. This was a glorious opportunity to do just that. If the GAA failed to take it though, they also brought others into what has needlessly escalated into a wider and predictable back and forth. This, when there’s no right for a second side to exist in such a conversation. Only that’s happened with people bringing baggage from all over to score points. Why don’t soccer have their own stadia? What do the FAI do with their own money? Who has any right to put this on the GAA? How much is John Delaney on anyway? Can we not step back and attempt to be the bigger and better person for once? Those countering of course will tell about how Miller long ago as a child played with Éire Óg, and reached the Sciath na Scol final with Ovens National School in a game that saw him line out in Páirc Uí Chaoimh, and that there was a GAA photograph on the alter at his premature funeral. However it shouldn’t have to come to that either, nor should it come to the fact that the renovation of the stadium involved €30m coming from the taxpayer. It was a head-in-hands moment, and it’s not overstating it to equate it with a child going in to visit a terminally ill friend in hospital, refusing to let the friend play with his toys as they are his, and being backed up by his present parents for being technically correct. That’s the level. Indeed why would anyone want to point out how they are on solid legal ground while drawing further attention to moral bankruptcy around a charity fundraiser for a young local man taken by cancer? It’s hard not to come across as a crank having a go at the idiot in the room for not getting it. But there are standards to maintain and this is at the top of that tree. The GAA hierarchy use the notion of business and brand as an excuse when doing what many of their members feel is wrong, yet if this is about business and brand, consider the damage done by their stubbornness here. Now when they go back to talking about being a community organisation, what will you say? The last time the GAA dropped their controversial Rule 42 for rugby and soccer internationals in Croke Park, and while an argument you may not have agreed with, that dissenting voice at least had a fair case about giving the competitors an advantage. That doesn’t apply here though. Instead it is about a widow. About kids who lost their father. About a local hero. About a kick-about and a few quid. About doing a grieving family a turn. And most of all, about a helping hand. Again remove feeling and think about all that. For when you cannot leave that hand outstretched in such a scenario, it means as a sport and a society we are worse off than even the biggest cynics and skeptics among us imagined. Independent.ie Newsdesk Tyrone manager Mickey Harte has said the decision to narrow the pitch at Healy Park in Omagh by 4-6 metres had nothing to do with him.